The wondermaterial graphene could have so many crazy applications: Computer chips that run on light, saltwater electricity generation, and on and on. Perhaps most humble and important of all, though, is energy storage. 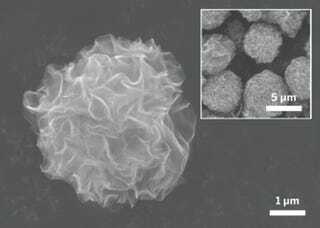 South Korean scientists have found a way to make pom-pom-shaped graphene microparticles ideal for electrodes, and it involves a process essentially like deep frying. The key to making graphene for use in batteries and capacitors is crumpling it into structures that maximize surface area. Remember how graphene was famously made by using scotch tape to peel off an one atom-thick layer off from graphite? Well, thin sheets also have an unfortunate tendency to stick and stack together, reducing surface area. To solve this problem, researchers in South Korea took a cue from airy, deep-fried batter. They sprayed a suspension of graphene oxide into a hot solvent, not unlike dripping batter into hot oil. The resulting pom-pom-shaped clumps of graphene nanosheets with lots of surface area. When applied to electrodes, it enhanced the capacitance compared to ordinary graphene sheets. Getting graphene into various 3D shapes has been a subject of pretty intense interest; Chemical and Engineering News notes other strategies have included making foams or aerogels, freeze-drying, and chemical vapor deposition. The authors say that this deep-frying strategy is one of the simplest and most direct ways of getting graphene into a 3D shape.